Cook pasta according to package directions. Check your garlic clove: if it has even a touch of green shoot in the centre, nick this out as it will be bitter, then cut the garlic into thin slivers. Heat the extra virgin olive oil very gently in a small pan over a low heat. When it is hot, add the garlic and cook for just 30 seconds or so. Don’t let it colour more than the merest fraction. Remove from the heat. 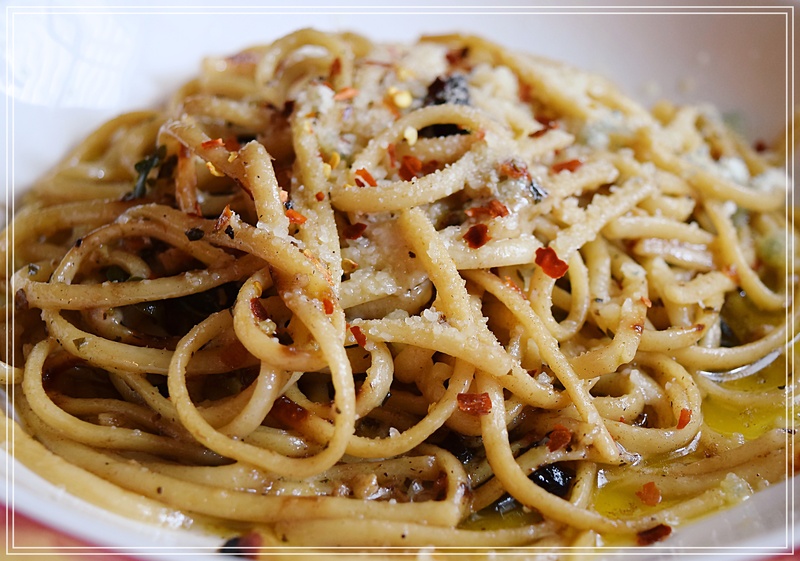 Drain the pasta and toss with the garlicky oil. Season with salt and pepper and transfer to warm bowls. I like this just as it is, without any cheese. But I wouldn’t begrudge you a few gratings of Parmesan or other hard cheese, if you feel the urge. Fearnley-Whittingstall, Hugh (2012-10-11). Hugh’s Three Good Things (Kindle Locations 3866-3879). Bloomsbury Publishing. Kindle Edition.